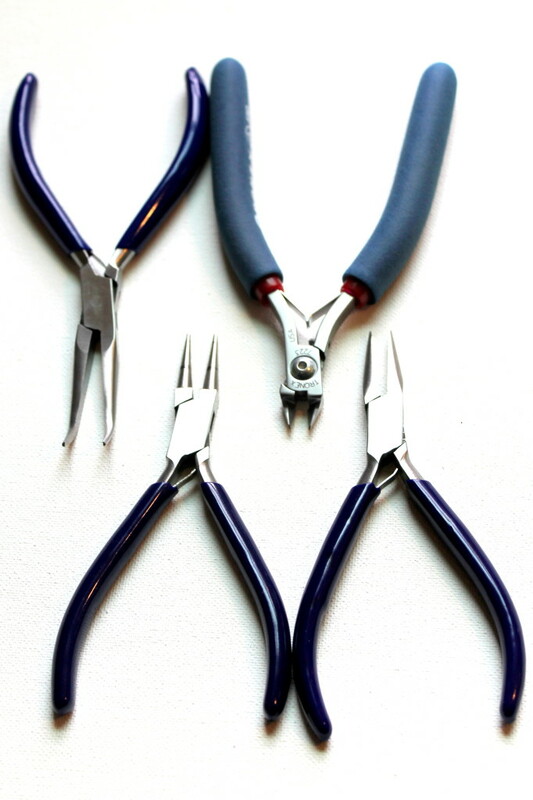 If you’re just getting started making jewelry, first think about the budget you have to spend on tools. What tools you can start with really vary based on the amount of money you can/want to spend. When you are just very first getting started it probably makes sense to not spend a ton of money on tools unless you’re really sure it’s something you’re going to keep doing. Jewelry making tools can get really expensive. You don’t have to start out buying expensive tools right away. On top of that, sometimes you don’t really know what tools you’ll use the most. There are different tools for different types of jewelry making and you’ll probably find that there are certain tools you’ll use the most. 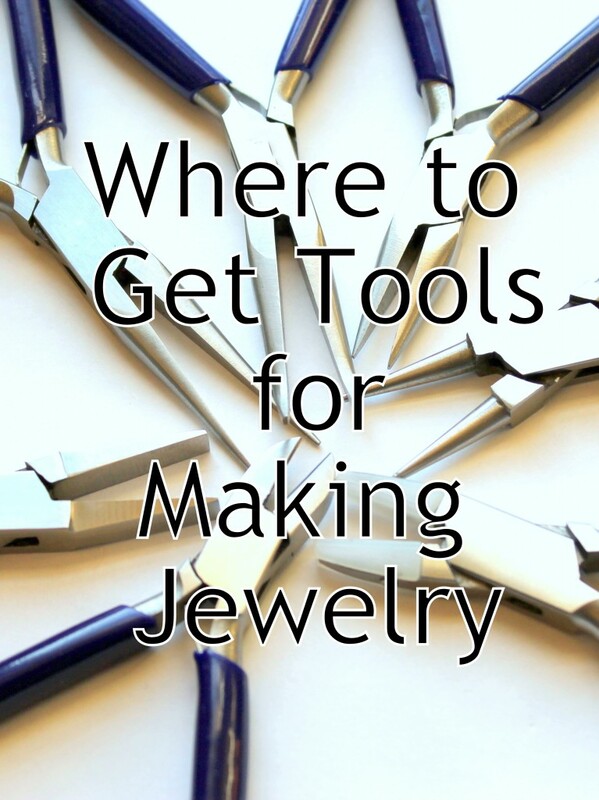 After you’ve been making jewelry for a little while and figure out which tools you’ll actually use the most you can upgrade those tools to the nicer, more expensive versions. For example, when I first started making wire jewelry I got a beginner set of pliers and wire cutters. As I’ve learned which tools I use the most (and frankly, as I’ve worn them out) I’ve replaced those specific tools with better quality tools. 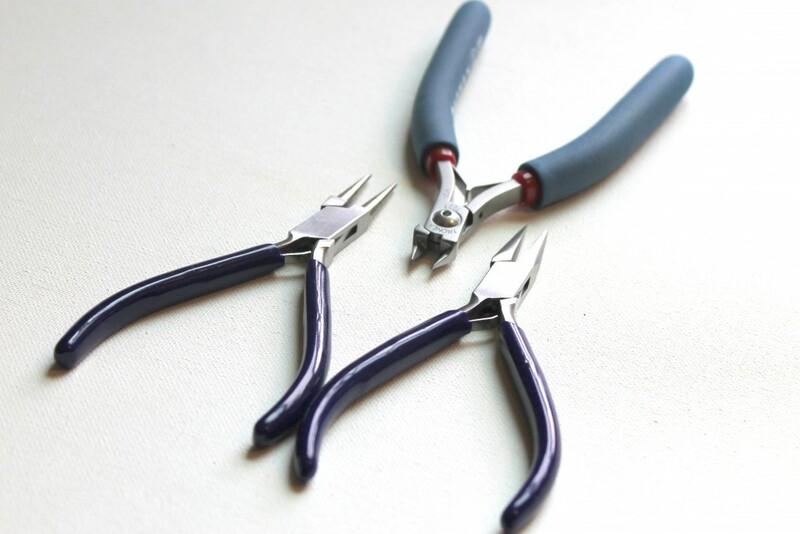 If you’re making a lot of wire jewelry, I recommend these 3 basic tools that you’ll use over and over again: wire cutters, round nose pliers and chain nose pliers. I also have an article I wrote about making jewelry on a shoestring budget that gives you options for switching out tools for items you may have around your house. Having said that, I’m going to give you a bunch of options and hopefully at least one of them will work for you. When I got started to begin with I found tools in my dad’s toolbox that worked for some things. This is not a long term solution if you’re going to be making a lot of jewelry, but if you’re just curious to get started it’s a start. Steer clear of tools that are serrated or have teeth on them because they’ll leave marks on your wire. If you’re just getting started, ask a friend to use hers. Then you can find out what tools you’ll really use the most and then invest in those. 3. Buy them at craft stores. I quickly found that I needed tools not from my dad’s toolbox (see #1) and needed to get a set. My first set came from A.C. Moore. And better yet, you can use the coupons that stores like Michael’s, Joann’s or A.C. Moore have online to get 40% or more off a set of tools. They also sell individual tools so you can pick and choose. If you don’t have these stores nearby, you can check out their online stores as well and get the same deals most of the time. Happy Mango Beads has a selection of inexpensive tools. Basically anywhere you find jewelry making supplies like beads, that store will probably also sell tools. And, of course, like everything else, you can find tools for making jewelry on Amazon. You can also find them in places like garage sales or sometimes on Craigslist or eBay someone will be selling a lot of jewelry making supplies that they’re no longer using and you can get a good deal on tools. Have a question for me? Contact me here. Get your Free 14 Day eCourse by filling out this form! This entry was posted in Jewelry Tools & Materials, Jewelry Tutorials and tagged how to make jewelry, jewelry making, tools, tools for jewelry making, tools for making jewelry by Kimberlie. Bookmark the permalink.